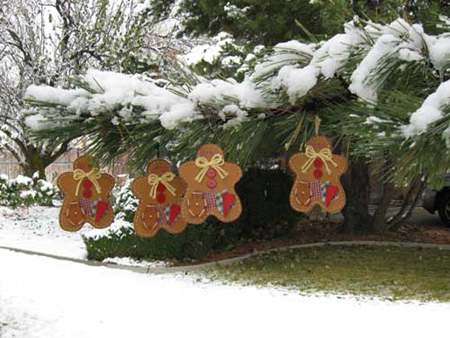 These little gingerbread boys think the snow is great! They are visiting my daughter in Utah. After the snow melts we will bring them indoors and place them all snuggled and warm back in their cozy little box. Next holiday season we will bring them out again. Since we live in Texas, we get very little snow. However, we have had two very good rains lately. After the extremely dry year we had in 2011 it was very much appreciated. I can’t believe January of 2012 is half over and I am still posting Christmas ornaments. Do you think I am a little behind? Thanks for taking the time to stop by, you’re always welcome back! This entry was posted in Painted wood crafts and tagged Christmas, christmas ornaments, country crafts, crafts, gingerbread man, holiday season, winter crafts on Thursday, January 19, 2012 by Betty. What a wonderful time of year. This is a little Santa I painted recently. I cut the design from 3/4″ white pine. After a whole lot of sanding and many hours of painting I finally arrived with the finished product. I like the way it turned out and it really was a labor of love. I can bring it out every year and it will always have a special place in our home. 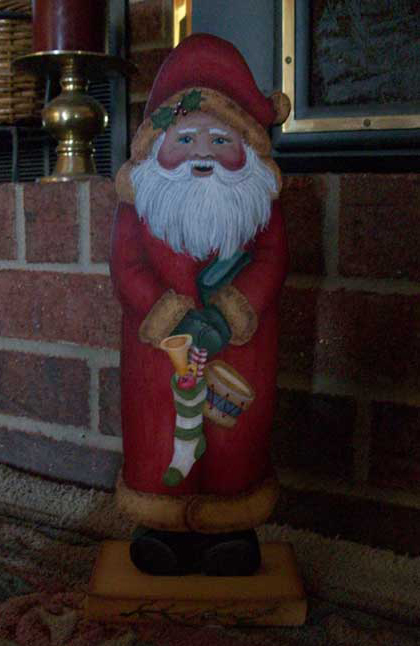 This entry was posted in Painted wood crafts and tagged Christmas, country crafts, crafts, Santa, winter crafts on Wednesday, December 21, 2011 by Betty. Just a funny little wooden pumpkin decoration I made to sit by the back entrance to say, “Welcome”, to our back door guests. Did you notice the little green hedgeapple sitting by the bucket? In Texas these are called horse apples. They are supposed to be used to repel bugs, spiders, ants, mice, etc. We are testing out that theory. We will see if they work. This entry was posted in Painted wood crafts and tagged country crafts, crafts, fall woodcrafts, hand painted, hedgeapple, pumpkin on Monday, October 31, 2011 by Betty. The weather is getting cooler, the leaves are falling and winter will be here soon. After our extremely hot and dry summer, believe me it is very much appreciated. 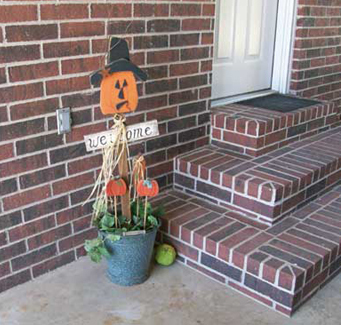 Can anyone resist putting out their fall decorations? Not I. The rich yellow, orange and deep red leaves falling from the trees are quite lovely. This pumpkin is just a little something I made some time ago. It is made from 3/4 ” pine and decorated with a red heart, half-moon, star, and grapevine. It was one of those projects where you use what you have and design as you go. I love this fall season. It always seems to say, come, it’s time to sit and rest awhile. Til next time, thanks for stopping by! 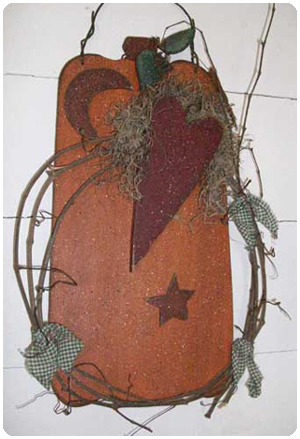 This entry was posted in Crafting & Painting, Painted wood crafts and tagged country crafts, crafts, fall woodcrafts, hand painted, pumpkin on Monday, October 17, 2011 by Betty. I made this paper plate holder from 3/4″ white pine. It is painted sky blue with white clouds. It has been sealed with a coat of clear varnish. I use it in my kitchen sitting on the counter to hold my paper plates. This is a Gail Eads design from her painting book “Country Nest”. Have a great week everyone, and keep painting! 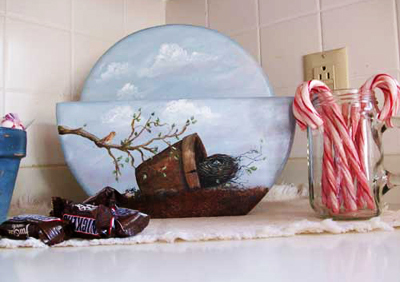 This entry was posted in Crafting & Painting, Painted wood crafts and tagged birdnest, country crafts, crafts, hand painted, paper plate on Sunday, September 11, 2011 by Betty. This is just a handy little wooden box that offers storage for everyday items such as pins, needles, buttons, keepsakes, and all sorts of treasures. It was painted medium blue with fruit on a dark blue top. I finished it off with a coat of clear varnish. Yea, pretty neat box. 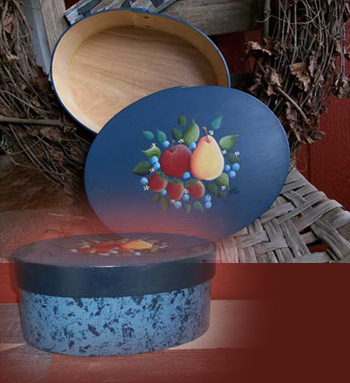 Do you have a handy little box you use to store your treasures? Please comment!Would love to hear from you! 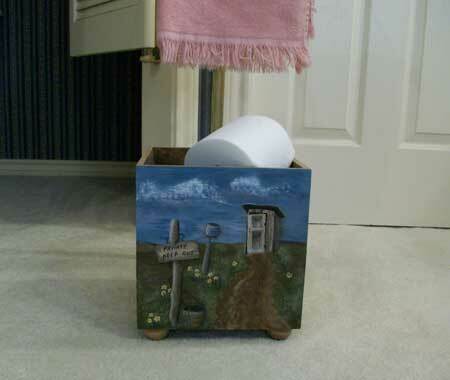 This entry was posted in Misc painted crafts, Painted wood crafts and tagged country crafts, crafts, hand painted, wooden box on Sunday, August 21, 2011 by Betty.